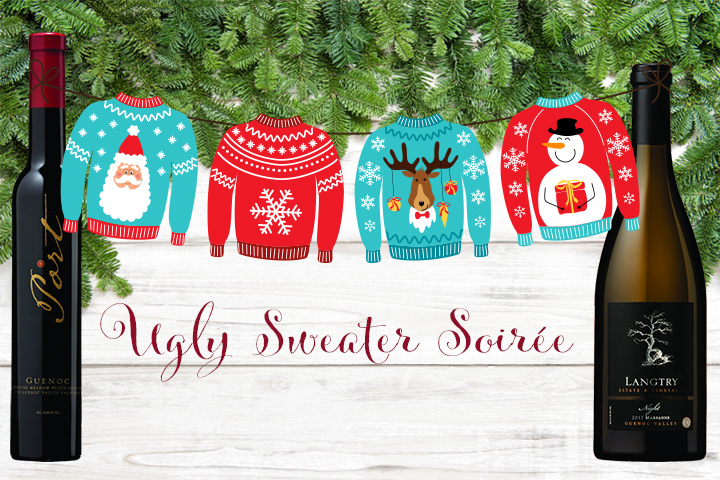 Join us as we deck the Langtry Estate halls with the Ugliest Sweater Soirée of them all! Here is how it works...that sweater that you thought was so cute in the 80's, however never could find a place to wear....well, dig it out! It's time to don your merry apparel! Enjoy some delectable bites, we will be pouring our 2017 Langtry Night Marsanne, Guenoc Valley AVA and to finish things off, a 2010 Langtry Petite Sirah Port, Serpentine Meadow, pairing. We kindly ask that you RSVP and/or purchase tickets to this event at least 24 hours in advance of the event. This allows us to best prepare for all of our guest’s experiences. Outside food, non-alcoholic beverages, beer, wine, coolers and/or BBQs are not permitted on Langtry property. Small bites, wine tastes, and additional beverages will be provided as part of this event. Wine will also be available for purchase by both the glass and the bottle.